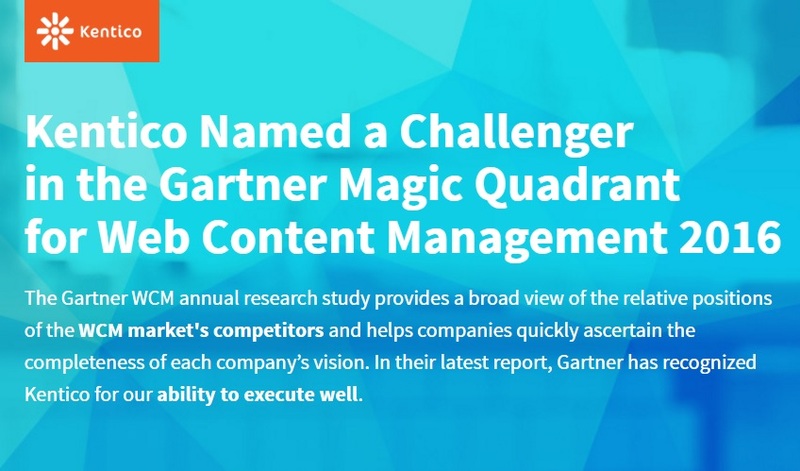 In a sentence, the most awesome CMS (Content Management System) Platform ever! Kentico is a CMS/EMS (Content Management System / Enterpise Management System), which are fancy abbreviations for systems that enable you to build stuff, more specifically web stuff. Pretty much anything you can imagine a website doing, this platform helps you do it. 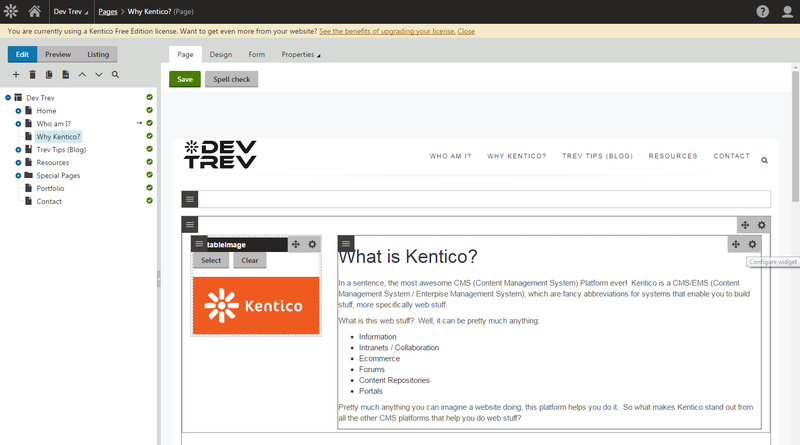 So what makes Kentico stand out from all the other CMS platforms that help you do web stuff? Why choose Kentico for your company? Because Kentico is a platform that is growing and will enable you to do the things you want to do with your site. Kentico has consistantly released a major version every year, adding new functionality and cleaner interfaces. It also released Hotfixes nearly every week to resolve any issues any uses may have reported. The processes to hotfix a site takes about 15 minutes thanks to it's Hotfix tool. Kentico has the capability to really do whatever you want it to do. I myself have built entire intranet sites where companies can order parts for service departments, built systems in Kentico to manage thousands of products with document and video assets, all with regional and multi-lingual support. I've built School sites, college sites, integrated with 3rd part platforms, APIs. I've built big sites and small sites, all in Kentico. I have yet to be limited by Kentico's capabilities, which means that when you as a company want to do something, Kentico is ready to take on the challenge, and your developers will thank you for being on a platform where it isn't a nightmare to accomplish. Kentico is available in a variety of license levels to fit your company's needs. And although the license cost is not 'free' it's much lower cost than othe enterprise level CMS systems like SiteCore. Through Heartland Business System's Partnership program, you can also get your sites licensed for less than a thousand a year. 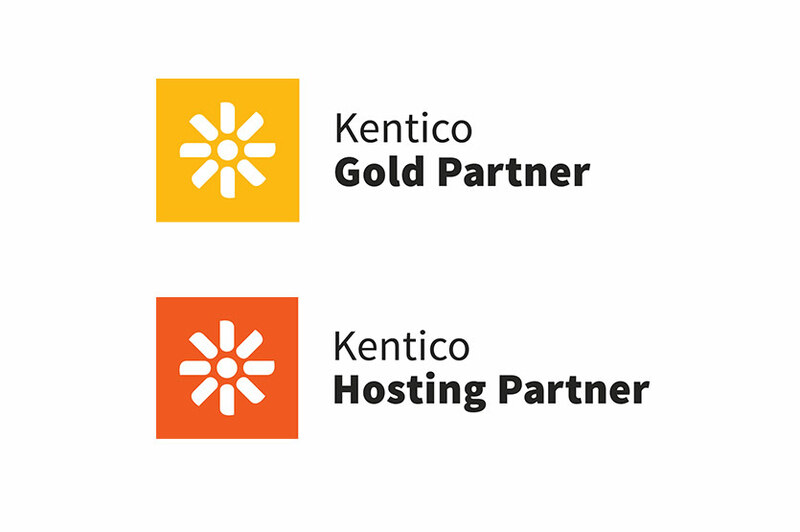 Learn more about our Kentico Hosting Partnership and get in touch with us! The first audience I want to speak to is Developers. Someone has to build the website, and this person we will label the "Developer." In some CMS Platforms, a Developer needs to know certain coding languages extensively, be it MVC, PHP, or the likes. The first point that makes Kentico awesome is you don't need a computer science degree to build in Kentico. In fact, Kentico provides the tools to build your entire site without touching code. Yes that's right, you can define your html templates, add functionality, create all your dynamic stuff, without knowing any .Net code at all. I've built entire sites where i've never once went into the back end code. This is thanks to Kentico's Awesome "Portal Method" which has the philosophy "You should be able to do manage your site through the web portal." If you are a Developer, being a Kentico Developer is easy! Needless to say, customers will usually want some sort of custom requirement, or special logic (like importing content from a seperate system). Other CMS system's I've worked in, developing was HARD. The Documentation was non-existant, the API was limited, and there were no good examples to go off of. Kentico is different in many different areas. Kentico's API is without a doubt the most expansive i've ever worked with. They have functions and methods for everything, and very well organized. There's not an aspect of Kentico that you can't control through the API, which means there's nothing you can't do. Kentico has documentation. 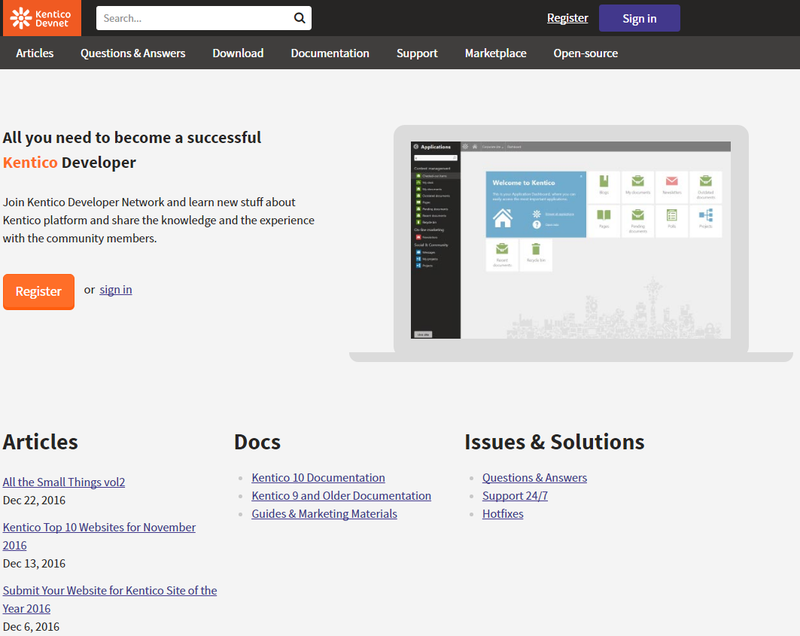 But not just any documentation, it has a HUGE documentation portal that tells you how to do everything, from basic stuff to the most complex items. 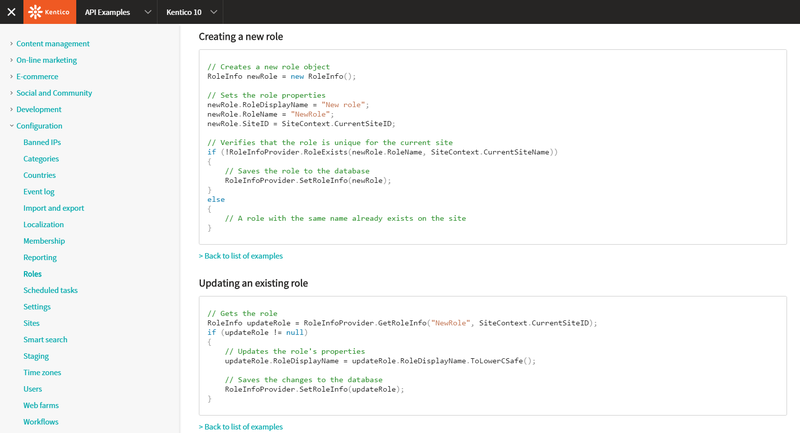 It also provides API example code so you can know exactly how to utilize the API. I've worked in some CMS systems where all their interfaces (like adding users, editing rolls) were locked down, hidden in compiled drivers. You couldn't figure out how they did any of it. But Kentico has all it's user interfaces open and available, so if you want to replicate something, you can actually see how they did it, so you can modify that. Kentico has standard coding practices, from how things are organized, to how to create custom modules, web parts, how to keep your site and code secure and fast. They outline all of this in their Best Practices for Customization and Securing your Website documents. Kentico has your back. First there is the DevNet, where you can ask questions and knowledgable Kentico enthusiasts (like myself) can help you. If that doesn't get you anywhere, Kentico's support team is without a doubt the friendliest and most helpful support team i've worked with. I've utilized them on many occasions, and they have always helped me out. The other aspect of a CMS is the Editors, those who add content and manage the website or web systems. Kentico's interface is simple and easy to use, allows for drag and drop widgets and web parts to allow easy management of your site. 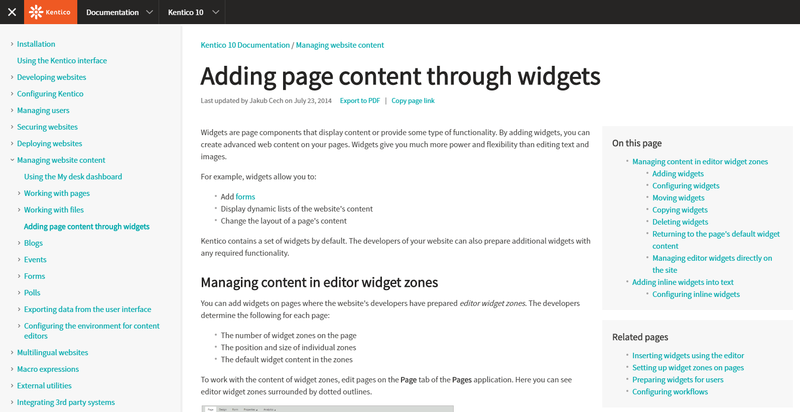 You can create custom widgets for your editors all through the portal (again, without touching code) to make creating content simple for even the most basic of users.